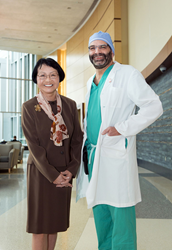 Danbury Hospital has received a generous leadership gift from Bridgewater resident Yoriko McClure to transform its cardiac operating room into a multi-functional cardiovascular surgical suite. Located in the Hospital’s Peter and Carmen Lucia Buck Pavilion, the new clinical space is scheduled for completion in 2018 and will be named The Yoriko McClure Surgical Suite at Danbury Hospital. Western Connecticut Health Network is the region’s premier, patient-centered health care organization serving residents of Western Connecticut and adjacent New York. The organization is anchored by three nationally recognized hospitals, Danbury Hospital, New Milford Hospital and Norwalk Hospital, and their affiliated organizations. The continuum of care offered includes numerous Western Connecticut Medical Group medical and sub-specialty practices, home health care services, a nationally renowned biomedical research institute, the Danbury Hospital & New Milford Hospital Foundation, the Norwalk Hospital Foundation and other affiliates. For more information, visit WCHN.org. Share your comments with us at Facebook.com/DanburyHospital; Facebook.com/NewMilfordHospital and/or Facebook.com/NorwalkHospital.